This is not your classic bread pudding and is based on modifications my mum. It's a lot simpler, tastes a million times better, and has been a family favourite for a long time. Unfortunately, I covered it and didn't let it cool down before putting it in the fridge, which meant that all the vapour condensed right into the pudding, making it soggy. Besides the consistency, though, the texture and taste were perfect. Add milk and bread to a saucepan and bring to a boil on medium heat. Add custard powder and 3/4 cup sugar. Stir for 15 minutes or so until the bread is dissolved and the mixture becomes thick. Add more sugar if needed. In a separate pan, heat remaining sugar to caramelize. Stir the pan (not with a spoon!) constantly to make sure it doesn't burn. 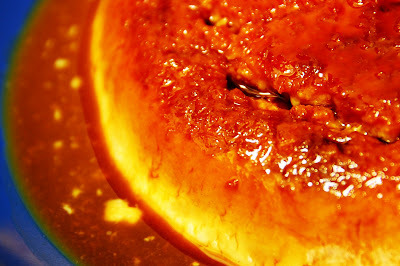 Transfer caramel to mold and coat the bottom thoroughly. Transfer the pudding mixture to the mold. Cool to room temperature, then place in fridge for at least an hour. Tip onto plate, caramel side up and serve.